The music program at Medea Creek Middle School offers a Lab Band, Intermediate Band and Concert Band, Jazz Band, and a Choir. Advancement to the next grade level relies on comprehensive knowledge and performance ability from the previous grade level. Theory components of Lab band will be the students’ foundation for musical growth within the program. Demonstration of proper participation skills along with self-discipline and motivation will drive students in learning scales and producing characteristic sounds on their instruments. Fundamentals and instrumental pedagogy will be the main objective of the program. 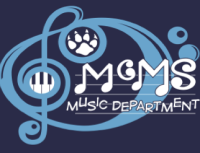 MCMS Bands are performance-based classes. This requires students to perform on grade level together to be successful as an individual within each ensemble. Improvisation will be taught in Jazz Band, which is offered as a before school extracurricular activity, and is by auditions only. Our music program not only teaches music but also prepares students to be responsible, organized, well-disciplined citizens. The curriculum for each class outlines requirements needed for successful completion of each band level. Being a performance based class; advancement relies on completion of the previous band level requirements. Lab band (Beginning Band) is open to any student in grades 6, 7 and 8. There is no need for prior musical experience. Students do not need to know how to read music to join at the beginning level. The only requirement is the sincere desire to learn how to properly play a musical instrument and perform in a band. Lab band members perform in two large concerts - winter and spring. Lab Band members also participate in Music 101 Workshop at Disneyland in January. Demonstrate proper participation skills and interaction within a large group / ensemble setting. Perform 2 major scales and chromatic scales as assigned by the state standards. Demonstrate knowledge of 7 major scales and key signatures. Intermediate Band is for 7th and 8th grade students who have successfully completed the Lab Band Curriculum. Intermediate band members will perform in the Winter and Spring Concerts. Intermediate Band members also participate in the Music in the Parks Festival in the spring provided they are able to perform the selected music to the satisfaction of the Band Director. Occasionally extra rehearsals maybe called before important performances, these extra rehearsals are mandatory. Advanced notice will be given. Perform the 12 major scales and chromatic scales as assigned by the state standards. Interact and participate as directors specify with the ensemble. This includes correct rhythm, notes, key signatures, style, balance and blend, intonation. Perform a solo or etude that has been approved and assigned by Mrs. Levine. Concert Band is for 8th grade students who have successfully completed the Lab Band curriculum and Intermediate Band curriculum or 8th grade students by audition only. Concert Band members will perform in the Winter and Spring Concerts. Concert Band members also participate in a festival in the spring provided they are able to perform the selected music to the satisfaction of the band director. Occasionally extra rehearsals maybe called before important performances, these extra rehearsals are mandatory. Advance notice will be given. Perform the 12 major scales and chromatic scale from memory as assigned by the state standards. Jazz Band is an auditioned group for 7th and 8th grade students already participating in band during the school day. This elite performance group is designed to offer our students greater breadth and depth in specific areas beyond the school day. Participation in Jazz band is by audition only, and students are required to take Lab Band, Intermediate Band or Concert Band as their in­–school elective. Students are encouraged to have at least two years of experience playing their instruments, and are encouraged to concurrently participate in private instrumental lessons. Jazz Band members will participate in the Winter and Spring Concerts, Open House, OP Music Festival, the Music in the Parks Festival and other possible performance opportunities during the year provided they are able to perform the selected music to the satisfaction of the Band Director. Jazz Band meets before school on Mondays, Tuesdays and Thursdays from 7:30 AM to 8:15 AM. Learn about basic jazz theory including intervals, key signatures, scales, chords, time signatures and rhythm reading. Learn and experience the history of jazz in American culture. Perform a variety of jazz literature. Learn to analytically listen to a variety of jazz music. Learn to improvise over chord changes and melodies of jazz music.